At Martin-Kaye Solicitors, we're sharing the love after receiving a top ranking on a national website. Our personal injury team is celebrating after being ranked as the fourth most loved team of their kind in the UK. Leading business directory www.thebestof.co.uk ranked them as part of the website's annual campaign where clients of UK businesses are given the opportunity to recommend their favourite companies. And now, the personal injury team have signed up to sponsor a mini heart on the website's promotional vehicle. Alison Carter, who leads the PI team and is a partner in the firm, said: "We wanted to celebrate all the good wishes we received from our clients after our ranking was announced, and joining forces with thebestofTelford's team seemed an appropriate way to mark our success. "We're very grateful to all our clients for such great feedback about the service we deliver, and we're hoping our ranking will improve still further in the coming 12 months." 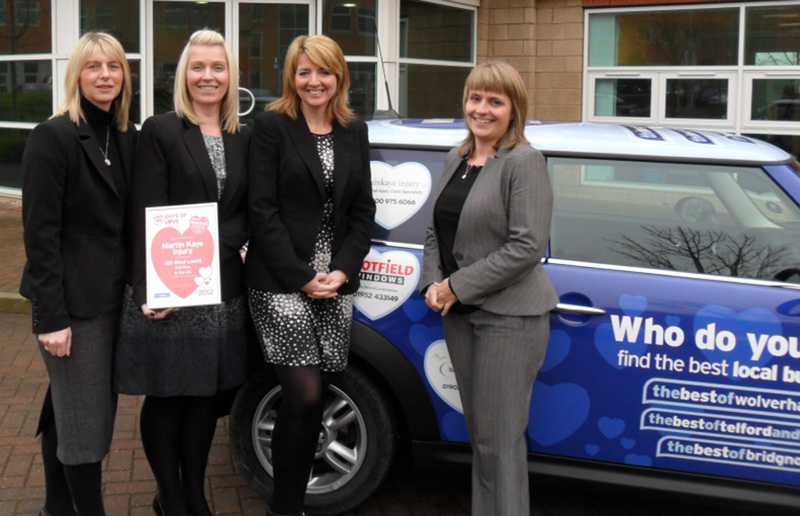 ThebestofTelford reserves the mini heart spaces on the side of its BMW Mini for the highest customer-rated businesses in the area.